Oprah.com raved that Asa Larsson's Rebecka Martinsson is a crime fighter who has 'all the needed gut insticts,' and listed the series as 'Mysteries Every Thinking Woman Should Read.' 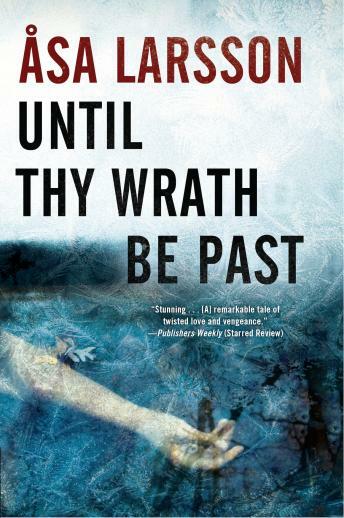 In Until Thy Wrath Be Past, the body of a young woman surfaces in the River Torne, in the far north of Sweden. Meanwhile, Rebecka Martinsson is working as a prosecutor in nearby Kiruna. Her sleep has been disturbed by haunting visions of a shadowy, accusing figure. Could the body be connected to the ghostly young woman in her dreams? Joining forces once again with Police Inspector Anna-Maria Mella, Rebecka is drawn into a murder and missing-person investigation that becomes entangled with old rumors of a German supply plane that mysteriously disappeared in 1943. Shame and secrecy shroud the locals' memories of the war, with Sweden's early collaboration with the Nazis still a raw wound. And on the windswept shore of a frozen lake lurks a faceless killer determined to keep the past buried forever beneath half a century's silent ice and snow. With its psychologically complex twists and turns, this harrowing thriller captivates from the very first page.